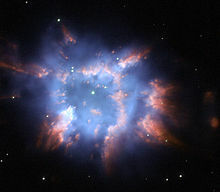 ^ A Planetary Nebula Divided. [21 December 2015]. ^ Hubble Offers a Dazzling Necklace. Picture of the Week. 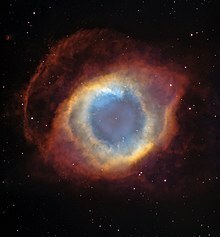 ESA/Hubble. [18 August 2011]. ^ Sackmann, I. -J.; Boothroyd, A. I.; Kraemer, K. E. Our Sun. III. Present and Future. The Astrophysical Journal. 1993, 418: 457. Bibcode:1993ApJ...418..457S. doi:10.1086/173407. ^ Castor, J.; McCray, R.; Weaver, R. Interstellar Bubbles. Astrophysical Journal Letters. 1975, 200: L107–L110. Bibcode:1975ApJ...200L.107C. doi:10.1086/181908. ^ Pan, Liubin; Scannapieco, Evan; Scalo, Jon. Modeling the Pollution of Pristine Gas in the Early Universe. The Astrophysical Journal. 1 October 2013, 775 (2): 111. Bibcode:2013ApJ...775..111P. arXiv:1306.4663. doi:10.1088/0004-637X/775/2/111. ^ Gregory, Stephen A.; Michael Zeilik. Introductory astronomy & astrophysics 4. Fort Worth [u.a. ]: Saunders College Publ. 1998: 322. ISBN 0-03-006228-4. ^ Cosmic Sprinklers Explained. ESO Press Release. [13 February 2013]. ^ R. Gathier. Distances to Planetary Nebulae (PDF). ESO Messenger. [31 May 2014]. Frankowski, Adam; Soker, Noam, Very late thermal pulses influenced by accretion in planetary nebulae, New Astronomy, November 2009, 14 (8): 654–8, Bibcode:2009NewA...14..654F, arXiv:0903.3364, doi:10.1016/j.newast.2009.03.006, A planetary nebula (PN) is an expanding ionized circumstellar cloud that was ejected during the asymptotic giant branch (AGB) phase of the stellar progenitor. Kwok, Sun; Su, Kate Y. L., Discovery of Multiple Coaxial Rings in the Quadrupolar Planetary Nebula NGC 6881, The Astrophysical Journal, December 2005, 635 (1): L49–52, Bibcode:2005ApJ...635L..49K, doi:10.1086/499332, We report the discovery of multiple two-dimensional rings in the quadrupolar planetary nebula NGC 6881. As many as four pairs of rings are seen in the bipolar lobes, and three rings are seen in the central torus. While the rings in the lobes have the same axis as one pair of the bipolar lobes, the inner rings are aligned with the other pair. The two pairs of bipolar lobes are likely to be carved out by two separate high-velocity outflows from the circumstellar material left over from the asymptotic giant branch (AGB) wind. 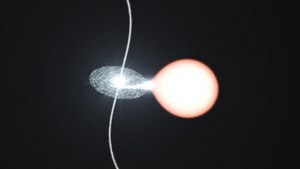 The two-dimensional rings could be the results of dynamical instabilities or the consequence of a fast outflow interacting with remnants of discrete AGB circumstellar shells. Kwok, Sun; Koning, Nico; Huang, Hsiu-Hui; Churchwell, Edward, Barlow, M. J.; Méndez, R. H., 编, Planetary nebulae in the GLIMPSE survey, Proceedings of the International Astronomical Union, Symposium #234, Planetary Nebulae in our Galaxy and Beyond (Cambridge: Cambridge University Press), 2006, 2 (S234): 445–6, Bibcode:2006IAUS..234..445K, doi:10.1017/S1743921306003668, Planetary nebulae (PNs) have high dust content and radiate strongly in the infrared. 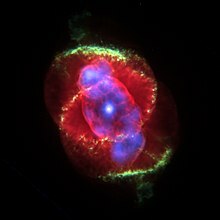 For young PNs, the dust component accounts for ∼1/3 of the total energy output of the nebulae (Zhang & Kwok 1991). The typical color temperatures of PNs are between 100 and 200 K, and at λ >5 μm, dust begins to dominate over bound-free emission from the ionized component. Although PNs are traditionally discovered through examination of photographic plates or Hα surveys, PNs can also be identified in infrared surveys by searching for red objects with a rising spectrum between 4–10 μm. Maciel, W. J.; Costa, R. D. D.; Idiart, T. E. P., Planetary nebulae and the chemical evolution of the Magellanic Clouds, Revista Mexicana de Astronomía y Astrofísica, October 2009, 45: 127–37, Bibcode:2009RMxAA..45..127M, arXiv:0904.2549, These objects are produced by low and intermediate mass stars, with main sequence masses roughly between 0.8 and 8 M⊙, and present a reasonably large age and metallicity spread.